GUEST BLOG by Jennifer Tepper: Opening Next Season: A New Broadway Theater?! Welcome to a new feature here on TheProducersPerspective . . . where I put a spotlight on someone else’s perspective. Every Wednesday, you’ll hear from someone in or out of our biz who has a unique perspective on what we do (or what we SHOULD do). Why, after 10 years, have I started allowing guest bloggers? Because the theater is a collaborative art form, and we can’t make our art, nor sustain our art with just one viewpoint. If we want to make more theater, then we need to collaborate more, so this blog will now be just that . . . a collaboration of perspectives of some of the coolest thinkers I know . . . some of whom I agree with, and even more interestingly, some of whom I don’t agree with. This is all part of our #5000By2025 mission. So stay tuned to this blog station. And first up, a former employee of mine, and now published Author, 54 Below Producer, and Esteemed Broadway Historian, Jennifer Tepper. I describe JT this way . . . if you were on “Who Wants To Be A Millionaire” and there was a Broadway Musicals category, she would be your phone-a-friend. Take it away, Jennifer! And make sure you subscribe to this blog to see who our guest poster will be next week. The Broadway theater crunch is at an all-time high. Thanks to the health of the industry, Broadway is booming – which means that there are A) more new shows than ever that are ready to come in and B) less existing shows than ever that are closing quickly in order to give them an open theater to come to. Back in the 1980s and 1990s there were many years where at least half of the Broadway theaters sat completely empty. EMPTY! It’s hard to imagine now. Because of this, a good number were destroyed or re-purposed – including the five that fell in the Great Theatre Massacre of 1982. But now, producers would die to have those theaters back in play. Imagine the shows that would be thrilled now to play the 955-seat Morosco on 45th Street? Or the Edison on 47th, which could be flexibly made into a thrust house or theater-in-the-round for a new production? I gave a TEDxBroadway talk about this a few years ago. How do real estate and specifically the theaters we destroy affect the kind of shows that are produced in New York City? Since I gave this talk, the theater crunch has gotten even… crunchier. There are more producers than ever dying to expand the number of Broadway theaters so that they have spaces for their shows to open. I have heard that theater owners are hungry for more spaces as well. In December 2015, it was announced that the Hudson Theatre would be re-opened as a Broadway house for the first time in almost 50 years. It had been operating as a hotel event space. Thanks to the New York Landmarks Commission, the Hudson could not be destroyed – after the 1982 theatre massacre, a campaign was waged to landmark every other Broadway theater. If we hadn’t knocked down the Morosco, Hayes, Bijou, Astor, and Gaiety, then we would not still have theaters like the Hudson, which were landmarked only because others were destroyed… and can now re-open during this popular chapter for Broadway. By February 2017, Sunday in the Park with George was playing at the Hudson. That’s a fast turn around! And the theater has been in-demand ever since – just as all 41 of Broadway’s houses are today. >With all of the buzz and hope in the air about more Broadway theaters, could there be others on the way…? This glorious theater was once home to shows including My Fair Lady and Jesus Christ Superstar. In 1989, it was sold to the Times Square Church, who still occupy the venue to this day. They have done a magnificent job keeping the space as gorgeous as ever. If you walk in for a church service, you can see that it is in great shape for a large Broadway musical to open in, in the near future. I recently walked through the Hellinger (sorry, Times Square Church) with many of the original cast members of Legs Diamond, the last show in the theater. The church kindly brought us on a nostalgic tour when we were presenting a reunion concert of the musical at Feinstein’s/54 Below, where I’m the Creative and Programming Director. The Hotel Edison is truly at the heart of Times Square. Cutting through from 46th Street to 47th Street, between Broadway and 8th Avenue, the structure holds multiple dining and entertainment spaces… including the Edison Ballroom. For one year in the 1950s, and then 20 years beginning in 1970, this space was a Broadway house. 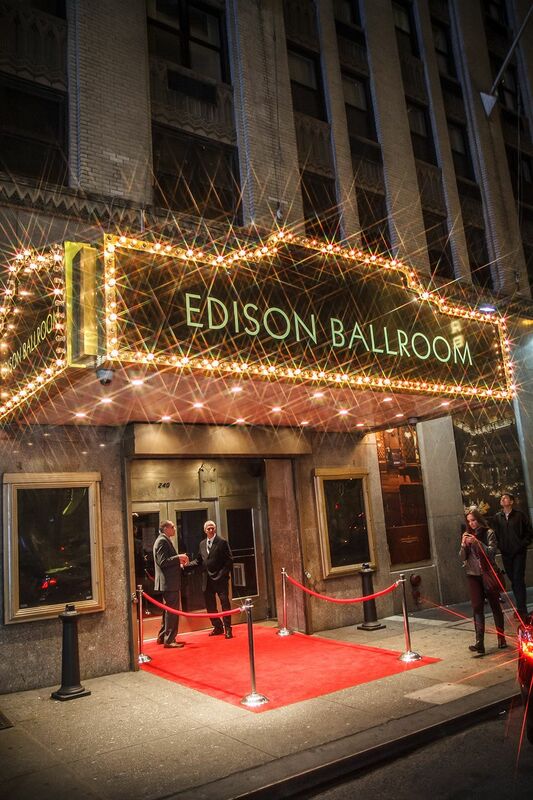 The Edison was one of the most alternative venues ever to be called a Broadway theater. It spent time as a theater in the round… it housed Broadway’s most infamous ‘nudie show’ (Oh! Calcutta! )… it was independently run in the midst of a theatre district monopolized by the three major theater owners. More so than any other Broadway theater before or since, the Edison Theatre marched to the beat of its own drum. In this era of demand for alternative theatre spaces, could it do so once again? For years, the Ed Sullivan Theatre on Broadway at 53rd Street was home to The Late Show With David Letterman, and now it houses the television program with Stephen Colbert as host. But before that, in the 1920s and 1930s, it was a Broadway house built by Arthur Hammerstein and named Hammerstein’s Theatre for Oscar Hammerstein I. (Arthur’s son and Oscar’s grandson was Oscar II, writer of shows from Oklahoma! to Carousel to The Sound of Music.) It is a beautiful former Broadway house, kept in fantastic shape. Could Hammerstein’s someday open its doors to Broadway once again? The Liberty Theatre on 42nd Street was a Broadway house from 1904 to 1933. During the Depression, many Broadway theaters were abandoned and became movie houses. The Liberty was one of these. During the 1990s the city of New York purchased the Liberty in efforts to clean up Times Square, and it is now partially a barbecue restaurant, a diner, an event space, and the exterior for Ripley’s Odditorium. Odd, indeed! That said, there’s enough left of the Liberty that it could be transformed back into a legit theater someday. In 2015, the off-Broadway show Speakeasy Dollhouse: Ziegfeld’s Midnight Frolic played in the space, proving just that. Off-Broadway shows like this one will likely prove a key turning point in demonstrating these theaters viable are for future Broadway re-population. Do I sound like an evil Broadway scientist yet? 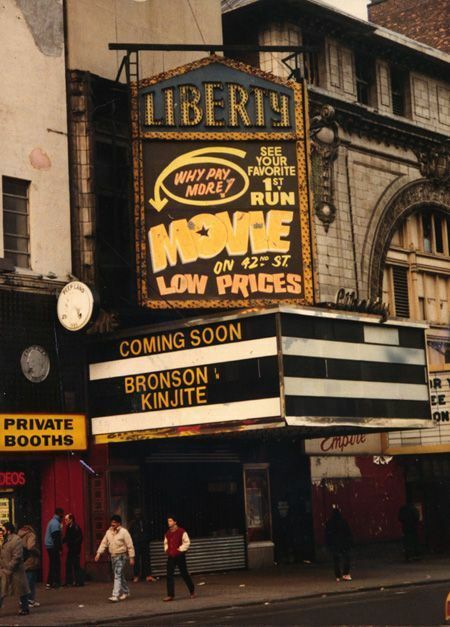 Of all of the theaters on this list, the Times Square is perhaps the most *lost* of all. It sits abandoned on 42nd Street, just next to the Lyric Theatre, future home of Harry Potter. While its exterior is on display in a significant way to passerby, few have been inside the Times Square in years. The Times Square opened as a Broadway house in 1920 and closed in 1933. During those years it housed shows like the original productions of Gentlemen Prefer Blondes, The Front Page, Strike Up The Band, and Private Lives. Many have tried to re-open the Times Square over the years. It was even announced as the home for Broadway 4D a few years ago. Nothing has come to pass yet, for a variety of reasons. This includes some spatial problems that were created for the Times Square when the Lyric, built in the 1990s by combining two other theaters, took some of its real estate for their new structure. But don’t count this space out just yet. Crazier things have happened on Broadway. The Diamond Horseshoe inside the Paramount Hotel on 46th has recently been home to shows like Queen of the Night. But most don’t know that in the 1970s and 1980s this space was counted as a Broadway house. Many shows with their sights on Broadway in the 2010s have innovative visions on how they’d like to interact with their audiences. Right now, only Circle in the Square allows for an immersive theatre experience on Broadway. If the powers that be worked to make spaces like the Century viable Broadway houses again, what kinds of groundbreaking shows might we see on the Great White Way? Stage 42, the off-Broadway house formerly known as the Little Shubert, has never been a Broadway theater, but I do dream about it being one someday. Add one seat to Stage 42’s 499-seat capacity and you have a theater eligible for Broadway status, where smaller commercial shows could find a home. And The New Victory, a beautiful theater on 42nd Street that houses family entertainment, originally opened as a Broadway house in 1900 and was for awhile run by David Belasco. It too could potentially function as a great space for smaller commercial Broadway shows. … On the other hand, I’m also thrilled for what these two theaters are now: great, big off-Broadway houses. In addition to wanting more Broadway houses, I also long for more viable off-Broadway theaters on the larger end… which are finally coming back in demand… just when we’ve destroyed most of them. Oh, show business! So say a little prayer for the Hellinger, Edison, Hammerstein’s, Liberty, Times Square, Century, Little Shubert, and Theatre Republic. Just like the Hudson, they could come back to Broadway life someday. Anything is possible in the theatre! … And if a future era finds our theaters endangered again, get ready to protest outside the American Airlines (which isn’t landmarked!) with me. How we treat the theaters themselves is so important, and has a huge impact on the generations and shows yet to come. P.S. In my book series The Untold Stories of Broadway, many tales about lost Broadway theaters are told. Each book features seven current Broadway theaters and one lost theater (the Hellinger in book one, Criterion Center Stage Right in book two, and Edison in book three). I’ve interviewed hundreds of theatre professionals about their work in different Broadway houses. Check out the books to read great Broadway stories from all of these folks as well as my own discoveries about each theater that I’ve made along the way! Do you have a unique perspective that you’d like to share with readers of TheProducersPerspective? Email me to apply for one of our guest blogger positions. Wonderful article! Thanks for the education. I’ll wager Times Square Church will have more visitors soon….including me! Great piece, Jennifer! I actually saw the Time Square Church stage a play, The Cross and the Switchblade, about the founding pastor’s efforts to reform gang members in New York City. At least the stage got some theatrical use. Amongst the theaters which saw the wrecking ball in the 1980s-90s, a forgotten one — or at least not mentioned in the blog above, was the Harkness (up near Lincoln Center). Despite its mauve or lilac blue color motif, I thought that was a beautiful theater and was lucky enough to see SO LONG 114th Street there! Is that theater included in that book?